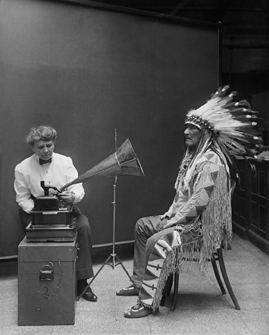 After Thomas Edison invented the phonograph and a way to record sound, several professional and amateur ethnologists began documenting American Indian music, culture, and traditions. Information was recorded on wax cylinders, Ediphone cylinders, and grooved phonograph records so that future generations would be able to hear the songs and stories in their native language. 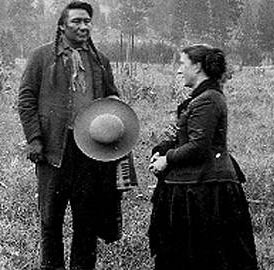 Among these ethnographers were Francis La Flesche from the Omaha Tribe, Alice Cunningham Fletcher, Edward S. Curtis, Frances Densmore, Melville Jacobs, and Gertrude Bonnin also known as Zikala-Sa, a native Sioux. 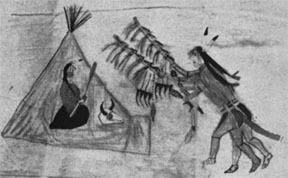 These individuals immersed themselves in Native American cultures and produced thousands of recordings from the Pacific Northwest and throughout the plains. This is not an exhaustive list of individuals, but some of the note worthy pioneers. 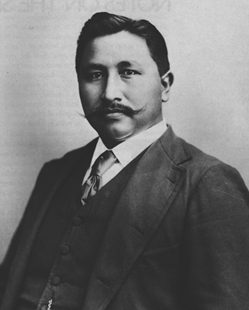 Francis La Flesche (1857-1932) was a professional American Indian ethnologist and member of the Omaha Nation. In 1979, his approximately 10,00 wax cylinders of songs and stories were transferred to preservation tape as part of the Federal Cylinder Project. The Library of Congress digitized some of these and posted them online. Alice Cunningham Fletcher (1838-1923) was a pioneer ethnologist who began studying archaeology under Frederick W. Putnam, Director of the Peabody Museum. In 1881, she arranged to live with and study the Omaha Indians of Nebraska. Recognizing the crucial role of song in ceremonial, Alice Fletcher began to collect Omaha Indian music early in her fieldwork with Francis La Flesche. She was a prolific writer and penned among other works, Indian Education and Civilization and Indian Story and Song from North America. 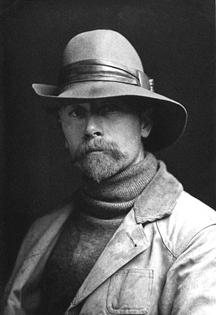 Edward S. Curtis (1868-1952) was a photographer of the American West. In 1906, he received funding from J. P. Morgan to photograph what remained of traditional Native American life. His work was a twenty volume masterpiece that included Geronimo, Red Cloud, Sitting Bull, and Chief Joseph. Curtis also used wax cylinders to collect 10,000 music and language recordings from 80 plus tribes. Only 276 survived and are housed in the Archives of Traditional Music at Indiana University. They are currently working on a digitization project. Frances Densmore (1867-1957) visited Ojibwa lands, preserved customs, and traditions of many Native American tribes by recording over 2500 wax cylinders. As a child Densmore developed an appreciation of music by listening to the nearby Dakota Indians She studied music at Oberlin College from 1884-86. In 1893, Densmore began a ten year preparatory period of study With Alice Cunningham Fletcher who became a teacher, mentor, and friend . During 1901, she made her first visit to the Chippewa of Ontario, and her first transcription of a Sioux song. In 1907, Densmore began recording for the Smithsonian Institution Bureau of American Ethnology that would last for fifty years. Melville Jacobs (1902-1971) was an American anthropologist known for his extensive fieldwork on cultures of the Pacific Northwest. 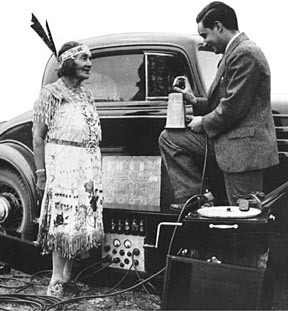 He used a variety of formats on which to record Native American music during the 1920s and 1930s. In total, Jacobs recorded 105 wax cylinders and 80 acetate and aluminum discs, containing a total of 524 songs of different types. These will be digitized through a partnership of The Archives of Traditional Music and Indiana University's Media Digitization and Preservation Initiative (MDPI). Zitkala-Sa (Red Bird) (1876-1958) was a Sioux writer, editor, musician, teacher and political activist. She was also known by her missionary name, Gertrude Simmons Bonnin. She attended Earlham College and played violin with the New England Conservatory of Music in Boston. Zitkala-Sa composed The Sun Dance with William F. Hanson, the first American Indian opera coauthored by a Native American. 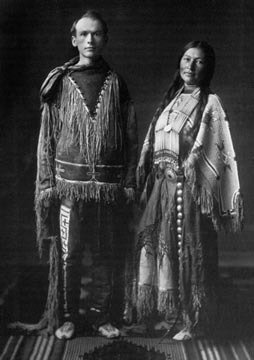 It was performed in 1913 by the Ute of the Utah reservation and in 1938 by the New York Light Opera Guild. No sound recording was made of the opera, but the score was preserved.